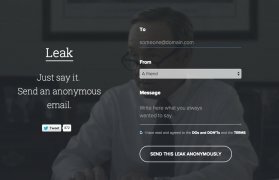 Until now, sending anonymous emails wasn't as easy as it is with Leak. This platform allows you to send messages without any sort of complication to hide our identity. Thus, for instance, we can play jokes, write love letters or mess up with someone's ancestors without being discovered. Sending anonymous emails is rather simple. You only need to input the email of the person to whom you want to send the message, choose the type of sender you are (a friend, relative, workmate...) and write the content of the message to be sent. Then the addressee will receive an email the subject of which will be the type of sender we chose, but without being able to find out who really wrote the message. Disclosures, leaks, declarations, jokes... Tell everyone with Leak. Leak's security level can be appropriate for leaks and disclosures of matters that aren't too important. Take into account that if you're going to get into something that may be a problem at legal level, the application doesn't guarantee that you're going to be unidentifiable by the corresponding authorities. 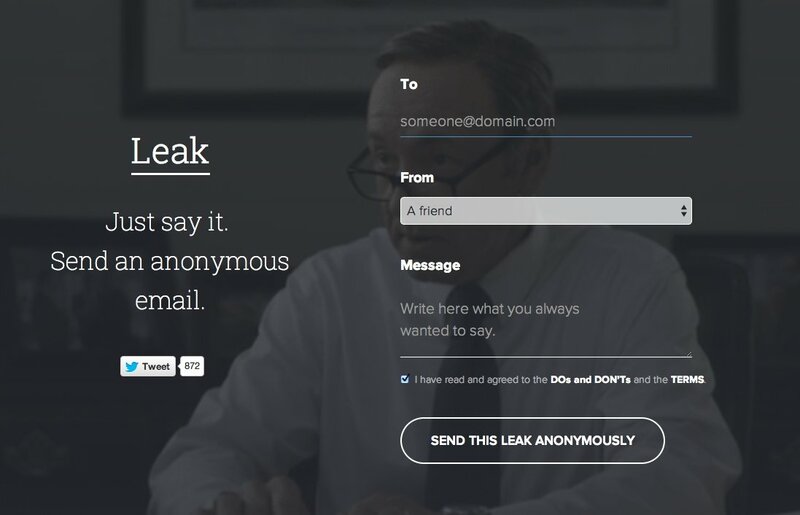 Now you know, if you need to speak your mind without revealing your identity, send anonymous messages with Leak.